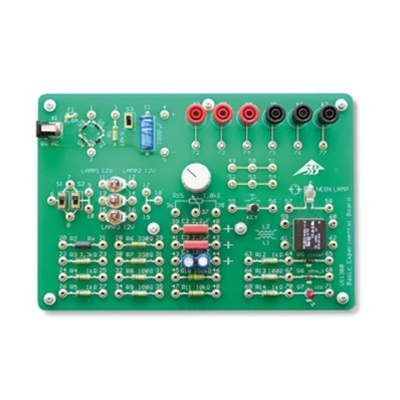 Experiment board with basic circuits for electricity and electronics: circuit components, Ohm's law, Kirchhoff's laws, rheostat and potentiometer circuits, two way switching, charging and discharging curves of a capacitor, inductive effects in DC and AC circuits. Simple semiconductor circuits for determining diode characteristics, rectifier circuits, filter factors. 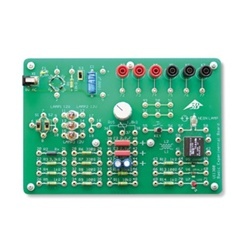 The components can be interconnected via 2 mm sockets using jumpers and experiment leads. Six 2 mm/4 mm safety socket adapters are provided for connecting 4 mm experiment leads. Includes 10 jumpers and 10 leads (5 red and 5 blue) with 2 mm plugs, 20 cm long, plus 8 V AC/500 mA mains power supply.